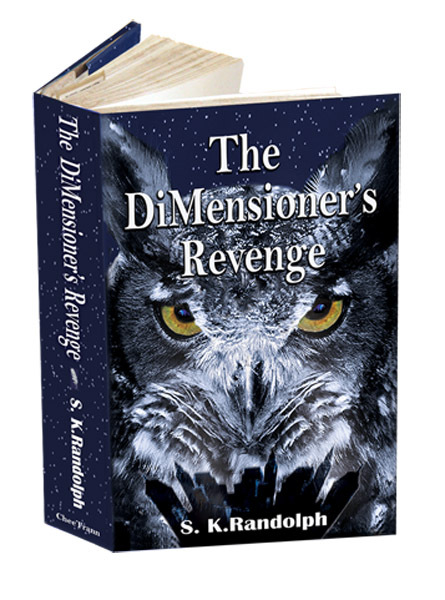 Yesterday, we posted the first part of an interview with fantasy writer S. K. Randolph, author of The Dimensioner's Revenge. Today, as Paul Harvey would have said, we have the rest of the story. 5. What is your goal with this book? Borderline dyslexia created some early stumbling blocks for me as a reader. When these challenges were overcome in fifth grade, the miracle of reading opened up a whole new world. Books provided an escape, a place to learn new things, and an avenue for exploring life in wonderful ways. My goal is to entice young people to read, to keep reading, and to get out from in front of the computer. With that vision in mind, I wrote The DiMensioner’s Revenge, the story of four young people and the impact life has on them—the lessons they learn and what they discover about themselves during a birthday adventure gone awry. As a former educator, I could not help providing life lessons, but my hope is that they are a natural part of the growth of the characters rather than a soap box. 6. The title says “Book One." Does this mean a series? The unfolding trilogy will consist of three books, of which The DiMensioner’s Revenge is number one. Whether or not I write spin-offs beyond that number remains to be seen. 7. Why did you choose to work with an editor? When I began this project, I did so simply to start and finish a novel. (I had begun two others that remain uncompleted.) The idea of publishing came later when friends and family who had encouraged me read the manuscript and began prodding me to publish. As the idea took hold, I realized I needed someone to help me unravel, shorten, and refine my “baby.” Now, I cannot imagine ever publishing without combining forces with someone more knowledgeable than I am about punctuation, point of view, show and tell, and all the things that make a book a worthwhile and interesting read. “Two heads are better than one” seems particularly apt in this circumstance. 8. What words of wisdom do you have for budding writers in this genre? Fantasy fiction provides one the opportunity to create new worlds, places, things, and creatures that are purely figments of imagination. This genre allows the writer to delve deeper into his/her own inner reality/creativity and bring forth the unusual, that which is far out of the ordinary. • Read other writers in the genre, learn the pitfalls, develop a sense of what works and what doesn’t and what you like and dislike. • Join a writing group where you can give and receive constructive criticism. • Find yourself a good editor, and don’t be afraid to edit and edit and edit (just because you wrote it doesn’t mean it can’t be improved). • Write every day, no matter what. • Write because you are passionate about it. Linda Lane edited S.K. Randolph's novel during the entire span of its development. She coaches writers through edits of their books and currently is developing e-courses on effective writing and editing. By fall her workshops will be available online for all who want to raise the bar on the quality of self- and independently published books. Learn more about her work at www.denvereditor.com. S.K. : Thanks for joining us! I loved your advice for up and coming writers. Spot on. Best of luck with your novel! Interesting to meet the editor as well as the writer! No matter how many times you read over your own material, you always seems to miss something! This was an incredible project to work on. We've said here on BRP that the writer and the editor must "click," must be of one mind," and must developed a collaborative relationship that transcends personality differences to maximize the the potential of the story. The DiMensioner's Revenge is an extraordinary example of that in action. An unexpected and delightful result of this working relationship is that S. K. Randolph and I have become great friends and have actually met face to face. We now look forward to working together on a number of future projects. Enjoyed the interview, and hope your book is very successful S.K. And I love your final bit of advice to new writers, "Have Fun." So often we forget to enjoy the journey. Thanks for the post. I enjoyed the interview. This is not a genre I write in, however the tips are universal. Great. Dear Blood-Red Pencil . . .
What fun to be a part of your blog. It certainly provided me with an opportunity to assess my process and thoughts about writing. Linda Lane’s patient support and good editing has taught me so much about good prose. She has been my mentor, my editor, and my friend. You can’t beat that! Thank you for our comments and support. I enjoyed reading the blog and being a part of it.